Cut the potatoes and eggplants, vertically into wedges. 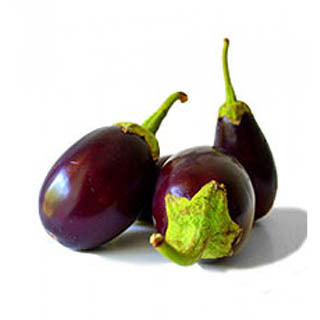 Keep the cut potatoes and eggplants in salted water. Heat oil in a deep bottomed pan (kadai), add cumin and fennel seeds. When the seeds change color, add potatoes and saute them for 2-3 minutes. Add all the dry spice powders and salt, mix properly. Add the cut eggplant wedges, mix, cover and cook for 10-15 mins on a low flame. Keep checking the veggies, after about 5 mins, and mix, so that they don’t stick to the bottom of the pan. Add very little water, if the veggies are sticking. When the potatoes and brinjals are cooked, sprinkle chopped cilantro (coriander). Serve hot with chapati, puris or parathas. Wash the Karelas (Bitter Gourd) and cut them into thin round discs. Heat oil in a wide pan, add the cut bitter gourd slices to it. Add turmeric powder, salt and amchur powder. Saute and mix everything nicely. Cover the pan with a lid and let it cook for 4-5 minutes on a medium flame. 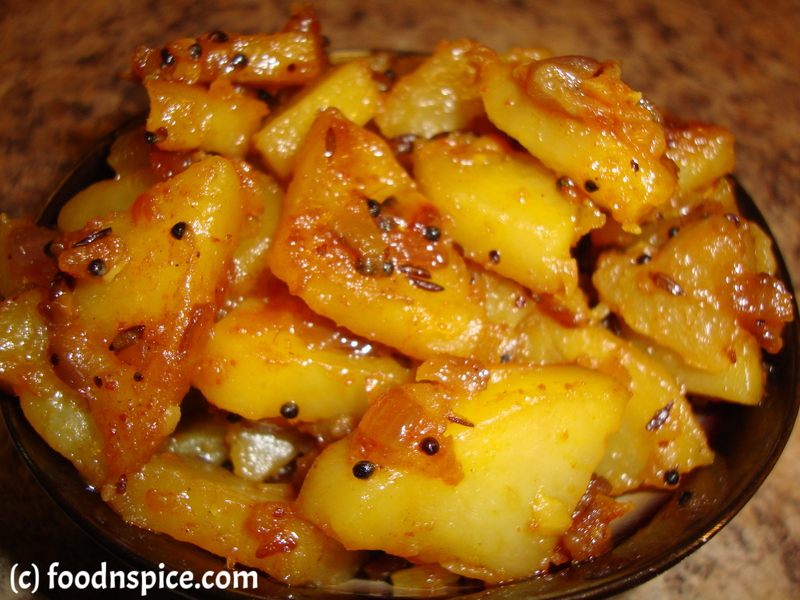 Keep stirring occasionally and allow to fry nicely till the slices of bittergourd are cooked and crisp. Serve with dalrice or curd rice. Let the puff pastry thaw in the refrigerator overnight. Adjust oven rack to middle position, and heat oven to 400°F. Line the baking sheet with parchment paper. 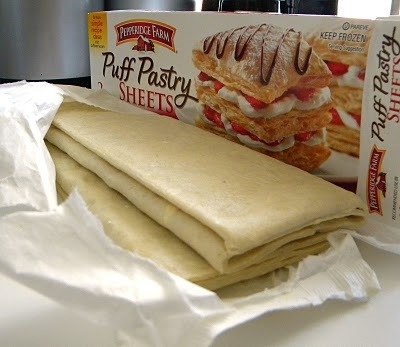 Open each sheet of puff pastry on a lightly floured board or counter top. Beat the egg with 1 tbsp of water and brush the surface of the pastry. Sprinkle each sheet evenly with salt, pepper, 1/4 cup of the Parmesan, 1/2 cup of the Gruyere, and 1/2 tsp of the thyme. Place a sheet of parchment paper on top of the cheese. Using the rolling pin, press the cheese mixture into the pastry. Remove the sheet of parchment and cut each puff pastry sheet crosswise with a floured knife or pizza wheel into 11 or 12 strips. Twist each strip several times, and then lay on a baking sheet lined with parchment paper. Bake for about 10 mins to 12 mins, or they are until golden brown and puffed. Don’t over-bake or the cheese will burn. Cool and serve at room temperature. Note : Don’t let puff pastry thaw too much, just enough that you can open the sheet. The colder the puff pastry, the more easier it is to twist the strips. * If you don’t want to use egg wash, you can use olive oil instead. Peel and dice the potato into small cubes. Keep the diced potatoes in water, so that they don’t turn brown. Heat oil in a pan, add mustard seeds, when they splutter, add cumin seeds. After the cumin seeds turn brown, add onions and saute till onion becomes transparent. Add hing, turmeric powder, kashmiri chili powder, red chili powder, and mix well. Add diced potatoes,salt and mix well. Add about one tbsp water and mix well. Cover and cook on low flame, stirring occasionally, until the potatoes are cooked. Soak the bamboo skewers in water for about an hour. Marinate the chicken cubes in the marinade and refrigerate for 2-3 hours or overnight. Preheat the oven to 400 °F. Thread the chicken cubes onto the skewers. 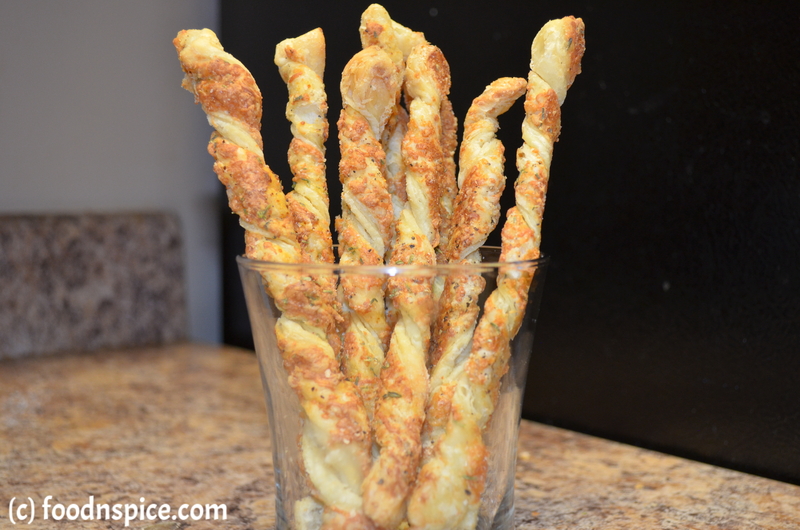 Place the skewers on a baking sheet, baste with oil and bake in the oven for 8-10 minutes. Turn the skewers, baste with some leftover marinade and bake for another 8 minutes. Broil the chicken skewers on high for another 2-3 minutes till the chicken chars a little on the edges. Baste with oil, if needed. 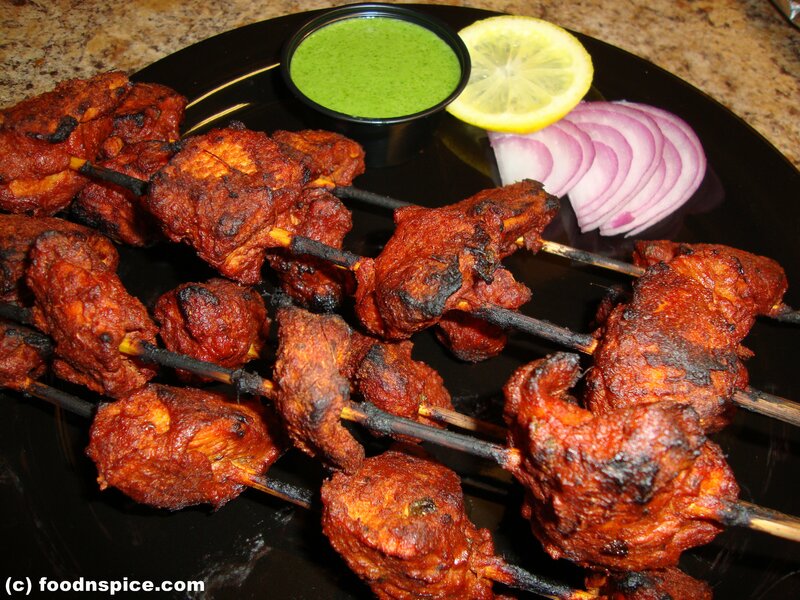 Serve the chicken tikka as is on the skewers or remove from the skewers. 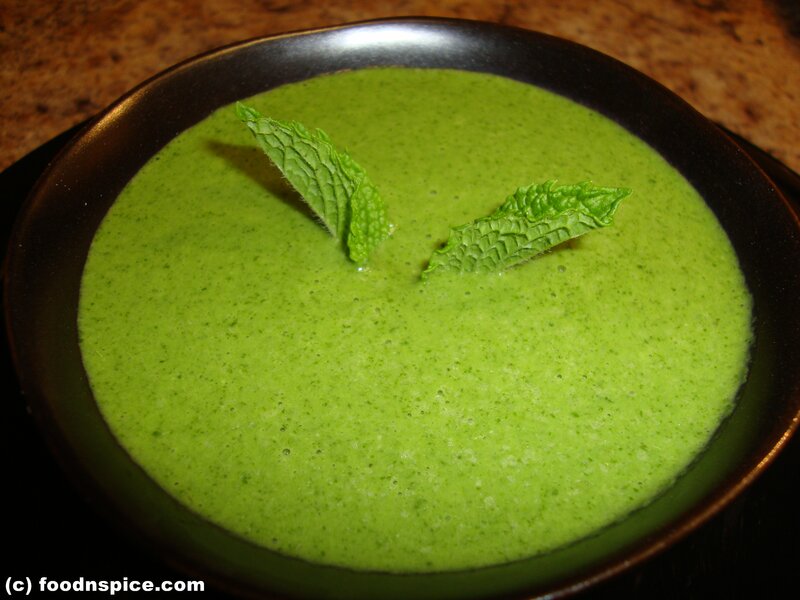 Serve with onion rings, lemon wedges and mint chutney.